What to do with so many plants? I have a thing for plants. This has led to me collecting many, many houseplants over the years. Since we’ve moved, the majority of them are happily hanging out on the back porch. They seem to really enjoy it back there, growing much larger leaves than they would inside. I have a number of pothos plants. I started with two and now have 7, not including ones I’ve given away. They are very easy to propagate, you just cut off a vine and stick it in water until roots grow and then plant it. When the vines get within chewing distance of our cats, I start to notice puncture marks in the leaves. I decided that a good way to keep the plants away from the cats would be to hang them up. 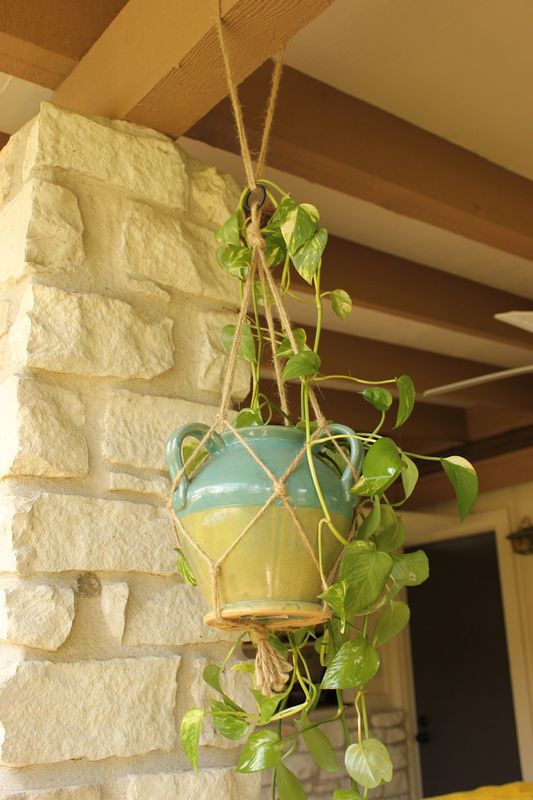 Conveniently, I came across a tutorial on Pinterest from skinny laminx for making your own plant hangers out of rope, twine, string, etc. 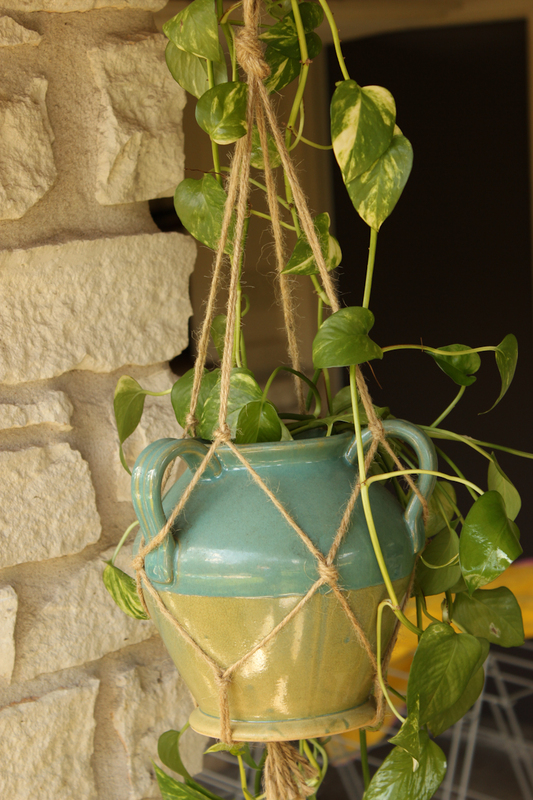 I picked up some thin hemp rope at the craft store and followed the tutorial to create a hanger for one of my plants. I have plans to make more some time soon. Bike MS training update #7: Wait, how far did I just ride? Unintentionally, this weekend became my first 100+ mile bike training weekend of the season. Unintentionally because my training plan (and what I planned in my head) had me riding 90 – 95 miles this weekend. Instead, I finished at 106 miles. Now, if you’re asking yourself why I would subject myself to riding more than 100 miles in the hottest Texas weekend so far this year, the answer is that I’m training for Bike MS: Pedal to the Point in August. For the past 5 years I’ve ridden in one of these events to raise funds for the Multiple Sclerosis Society because the disease has affected a number of people in my life throughout the years. Each year it seems I learn of another friend or family member touched by the disease. I hope that researchers can find a cure for MS. I’ve kicked off my fundraising, as I do every year, by personally donating to the MS Society. If you are able, please also consider making a donation to the society. They use the money to provide programs and services to people living with MS as well to fund cutting-edge research. So, back to my weekend training shenanigans. On Saturday morning, at 6:40 am (!!) I set out on my bike. I left as early as I could drag myself out of bed because I knew it would be hot hot hot. At 6:40, it was amazingly pleasant outside. In fact, the ride overall on Saturday wasn’t nearly as hot as I expected. I started north on Parmer Lane with the intention of doing a “Dam Loop”, a route that is damn hilly and passes the Mansfield Dam out by Lake Travis. This past week my hamstring has been bothering me and after about 10 miles out Parmer, I decided not to make the turn out towards the dam. Instead, I decided to ride out to Andice, TX which involves hills, but less of them. To get to Andice, you have to ride to the end of Parmer Lane and then make a turn on to ranch road 2338. On my way to the end of Parmer, I made friends with a nice gentleman and we chatted about different bike rides we done. He is training for the Hotter ‘n Hell 100 which lives up to its name from what I hear. We split ways at the end of Parmer Lane when I turned out towards Andice. At that point, my odometer read 30 miles, I knew I needed water, and was pretty sure Andice wasn’t too far down the road where I could replenish at the general store. Sigh. Andice was more than 5 miles away. The Andice General Store in my sight! And more importantly, it was CLOSED. 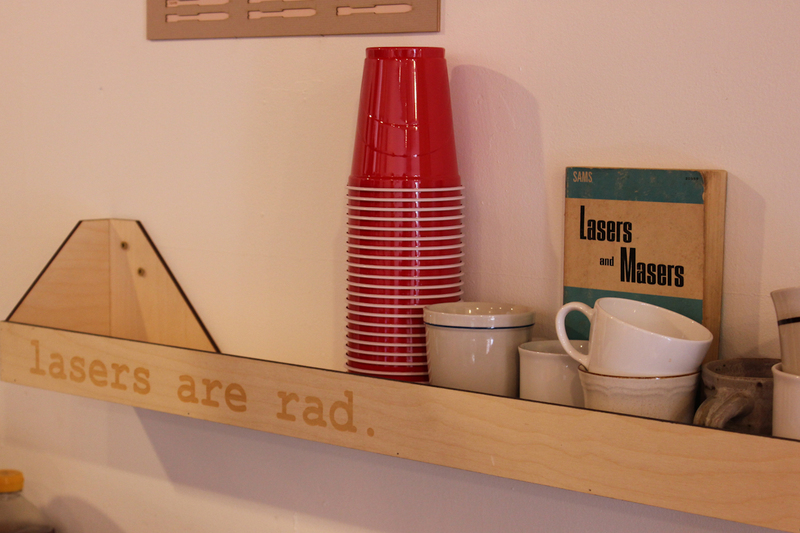 Austin cyclists: the Andice General Store opens at 8 am M – F and 10 am on the weekend. I was there at 9 am. Right after I pulled up, a large group of cyclists from the team in training showed up, also mightily disappointed. Luckily, someone found a spicket on the back of the building that I reluctantly used to fill my bottle. There really isn’t any other water source for many many miles. Oh Andice General Store, how you have forsaken me. Instead of turning around and going back directly the way that I came, I knew that there were back roads that would get me back to Parmer Lane. They were quite pleasant to ride on with almost no traffic and lots of shade. A nice smooth, shady road. One of the best parts of riding on Saturday was the very minimal wind I encountered. Even when the headwind started to pick up on my way back, it was still minimal and actually necessary to keep me cool-ish. It was just a great morning for riding in Austin. I ended up riding 69 miles for the day, a bit longer than I expected. Someone turned off the wind! Later that afternoon we went to the packet pickup for the Urban Assault Ride put on by New Belgium Brewing and stopped for a delicious treat at Bananarchy. Chocolate covered frozen bananas with toppings? Yes, please! And that brings me to Sunday’s ride. My husband and I participated in the Austin Urban Assault Ride. Last year’s Urban Assault Ride was about 18 miles when we finished. 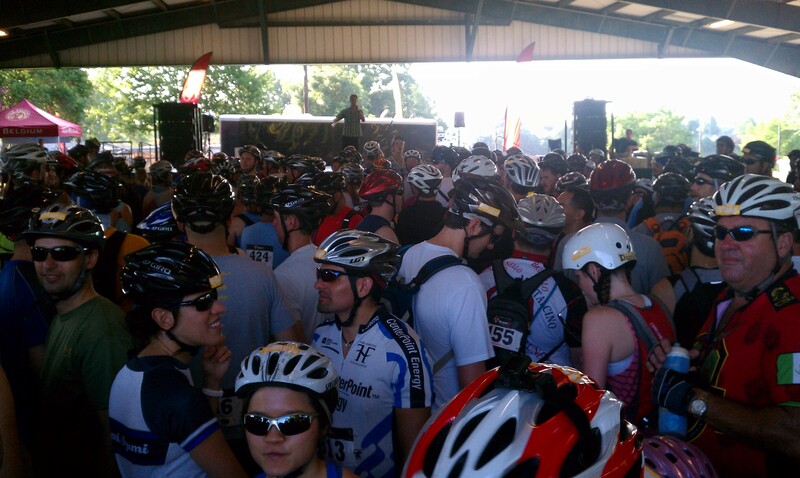 In order to get extra miles in, I rode the 13 miles to the start line at Fiesta Garden Park. To do this, I left at 6:20 am. It was noticeably hotter and more humid than Saturday despite the sun not even being up yet. The ride is a lot of fun. You have to ride to different checkpoints and perform obstacles in order to collect a bead that proved that you completed that obstacle. You also have to figure out the location of two mystery checkpoints. The obstacles included fun things like riding a bike while catching loops with a foam sword, jumping into a pool and collecting rubber duckies, riding an adult big wheel, and sitting on a skateboard and being towed by a bike. The husband and I were able to easily figure out mystery point 1, where we got the clue for mystery point 2. I thought I knew the second mystery point but was wrong, leading us to check a few locations before figuring it out. Also, we somehow skipped a checkpoint on our ride and had to back track to avoid a huge penalty. Because of our failures, I ended up riding 37 miles for the day, also longer than I had planned. Oh well, we did have beer at the finish line. Next year we hope our friends / partners in crime for the UAR will be riding with us again. Everyone lined up and ready to race! Recently I learned of Women.Design.Build, a local organization that encourages women to get involved in their community through design and construction activities. One way that they do this is through workshops where you can try out a new skill. Last week I attended a glass etching workshop at the MAKEatx studio. You know how we etched our pint glasses? With a giant LASER! Right up my alley, reminding me of days spent in the basement of the UT physics building working with lasers. 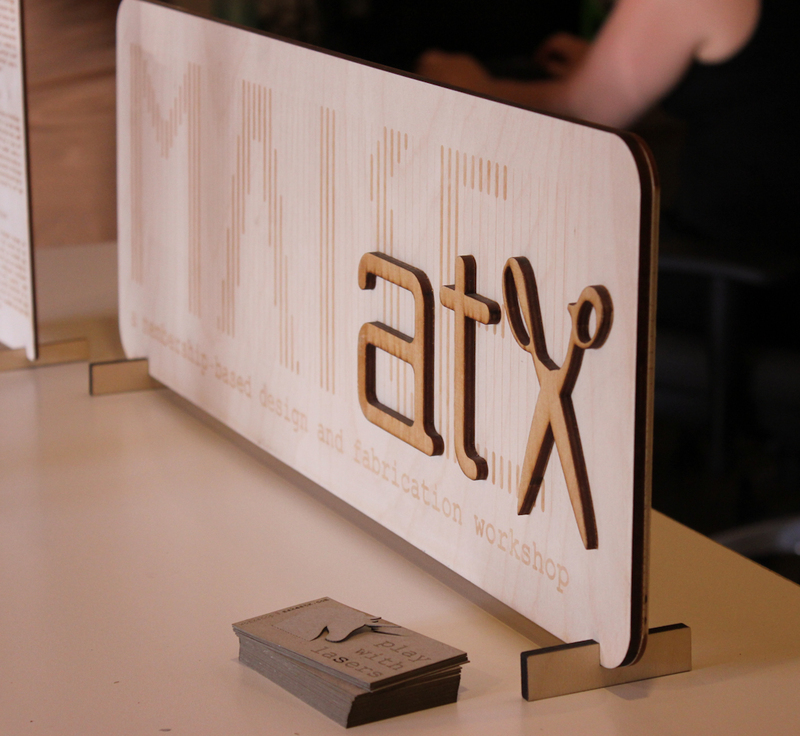 The MAKEatx laser is much more awesome than any laser I used in the past. Yep, that’s a giant laser. CO2 apparently. 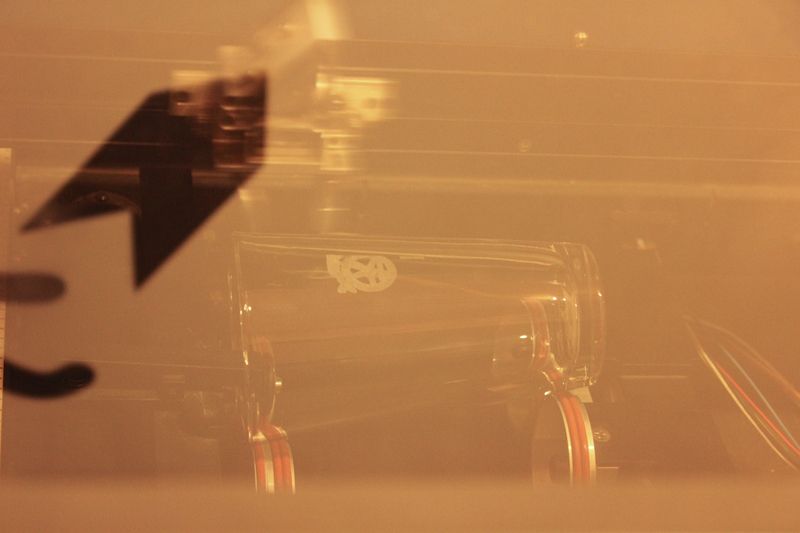 Prior to etching our glasses, we had to create a small black and white graphic to etch on the glass. 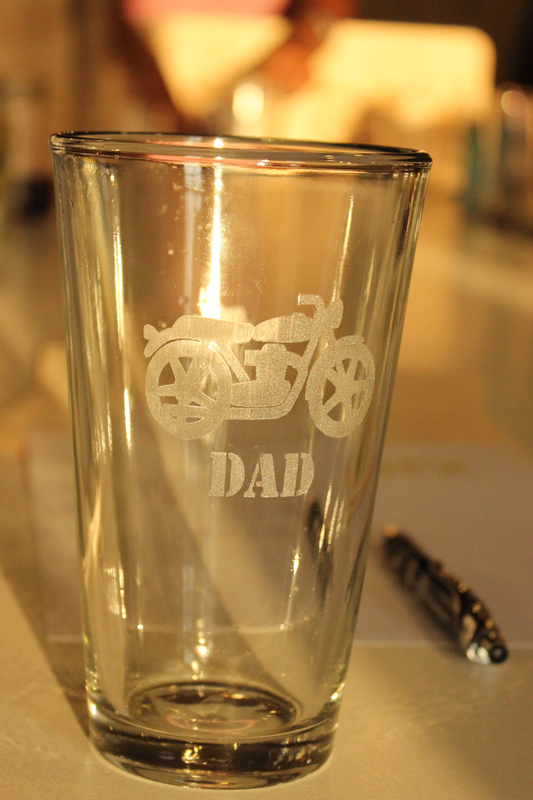 With Father’s Day right around the corner, I decided to make a gift for my Dad. He’s got a thing for motorcycles so I incorporated that into my design. Placing the pint glass in the machine required a bit of calibration. 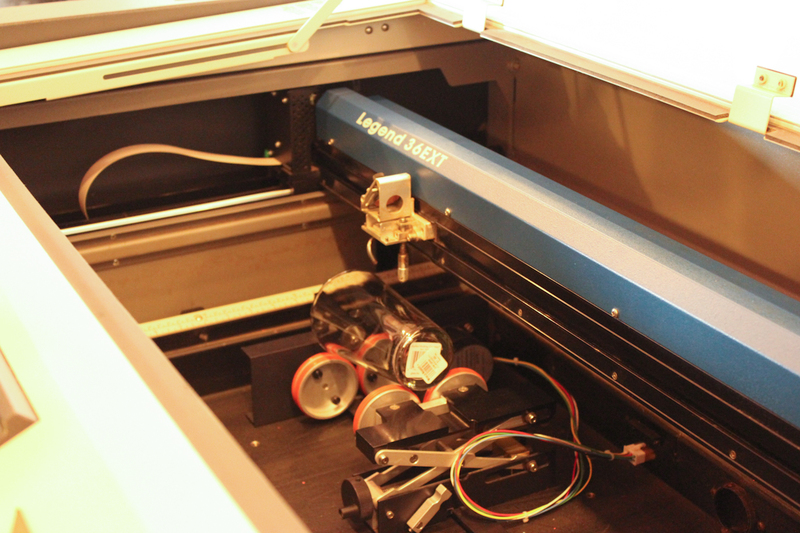 After the pint glass was loaded, the file from the controlling computer was opened to send the design to the laser. 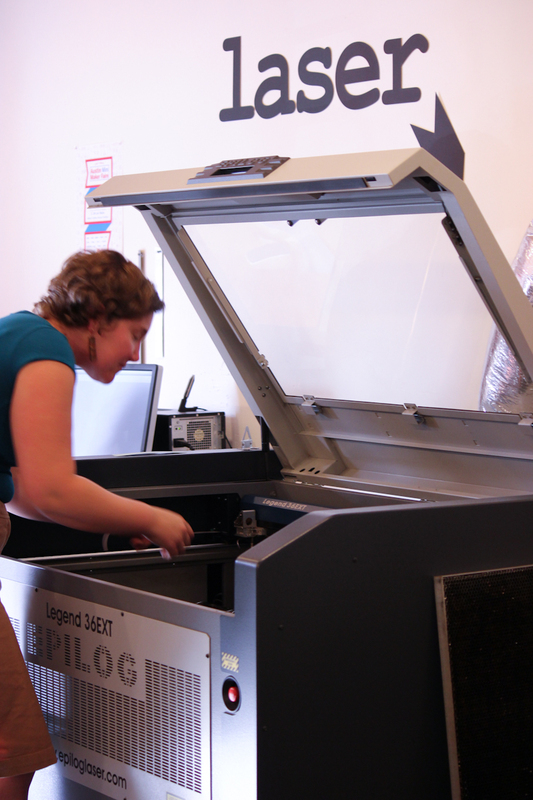 We closed the lid and pressed the go button and the laser whipped out our designs in no time. 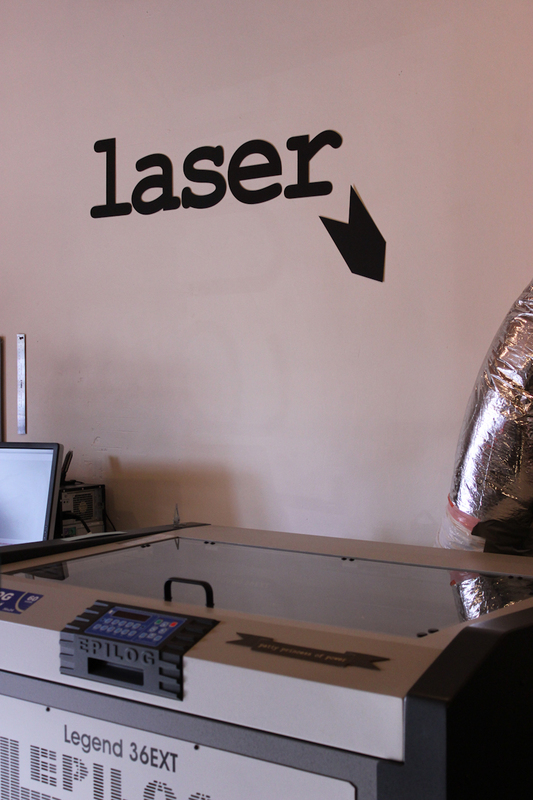 The laser in action. You can see one of the motorcycle wheels. There were about 12 of us in the workshop and many had to create their designs on the computers there. We had plenty of time to browse around the workshop and drink some wine. Everyone was very friendly and it was an enjoyable evening. I look forward to attending more events in the future. 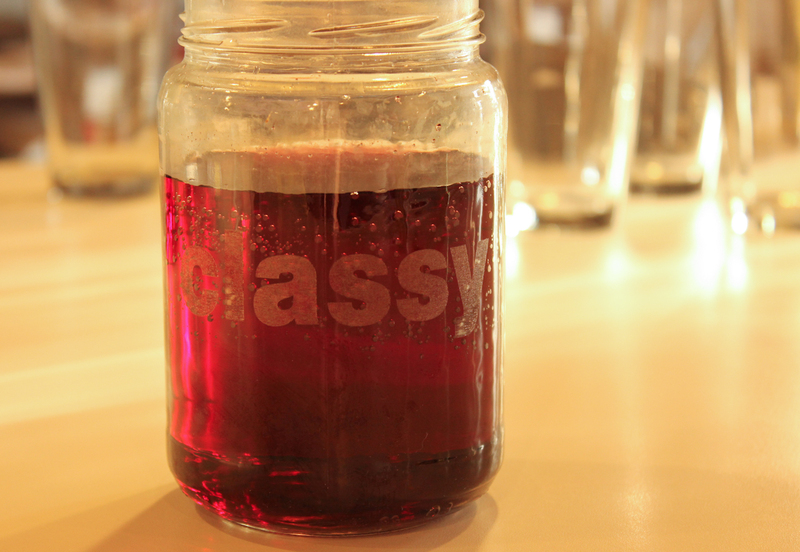 Another etched glass – a mason jar that says classy. For drinking wine of course. 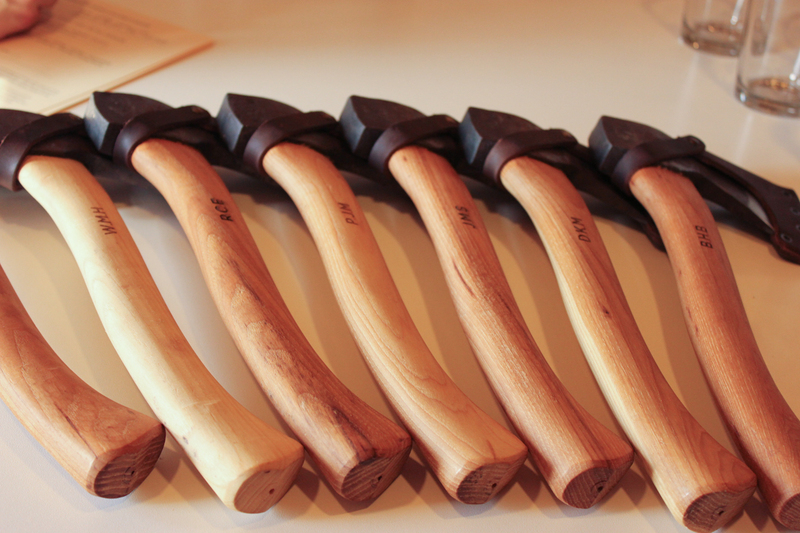 Amazing groomsmen gifts – hatchets etched with initials. 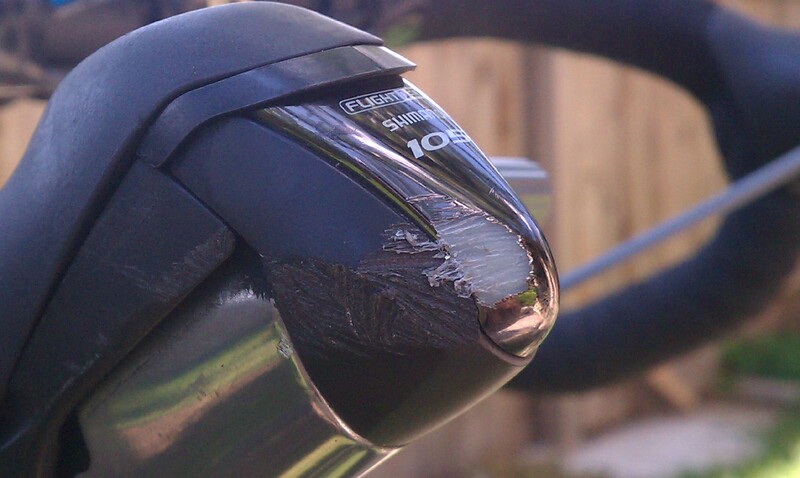 I’m happy to report that I have continued to heal from last week’s bike crash. Which is good since I’m in the middle of training for Bike MS: Pedal to the Point, a 175 mile ride in Northern Ohio on August 4th & 5th benefiting the Multiple Sclerosis Society. Consider supporting my participation by making a donation today! This marks my 5th year fundraising for the MS Society. Every year it seems I learn of another family member or friend who has been diagnosed with the disease. On Saturday I headed out at 7 am for a 58 mile ride. It was a nice morning for a ride, if a touch humid. I went north on Parmer Lane and eventually made a turn on to a very bumpy and scenic road. Along that road I ran into a young boy and his grandparents. He was learning to ride his bike with training wheels. They were very friendly and full of smiles and waves. I stopped at a little gas station with very friendly clerks around 9 am to fill up my water bottles. They were interested in my route for the morning. After the rest stop, I had the pleasure of a road runner running just in front of me for a few seconds. Awesome birds. After turning back on Parmer Lane to go south, the headwind had picked up (of course). I saw tons of cyclists out on Bicycle Sport Shop’s Women’s Day Ride. I overheard that they got over 150 people out on their bikes, which is great. I could tell some of them hadn’t been out on bikes in a while so I’m glad they were braving the headwind. For a while on the way home I was behind two guys that blocked the wind for me, enabling me to ride much faster than normal. Thanks guys! On Sunday I got out on a 30 mile ride. I stuck closer to home, riding on Jollyville and loop 360. Not too windy and not as warm or humid. A great day for a ride. I have plans. Plans to have chickens. Some day. So right now I like to practice eating eggs in preparation. 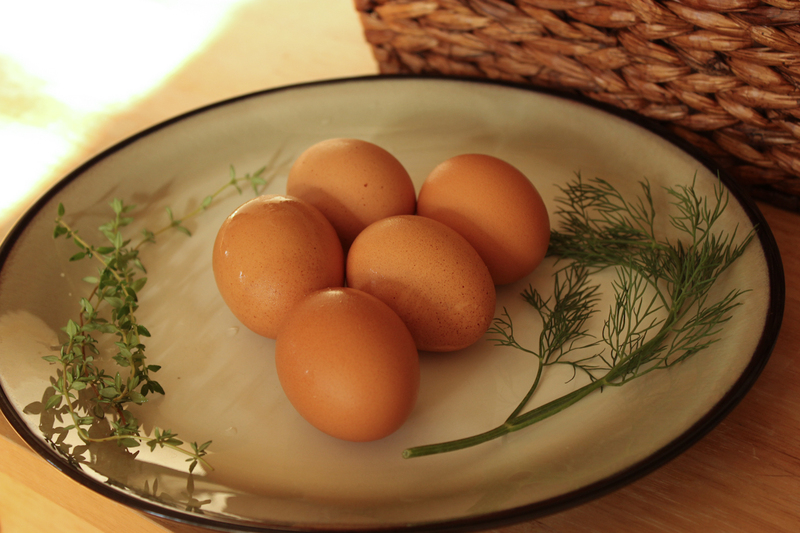 I want backyard chickens for the beautiful eggs they produce. 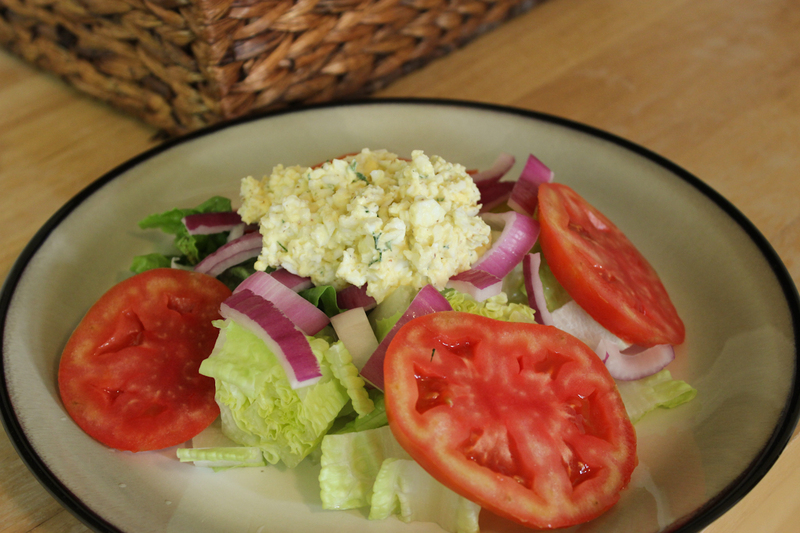 Last week I made a tasty egg salad for dinner. After hard boiling 5 eggs, I assembled thyme from my garden and fresh dill from the store. 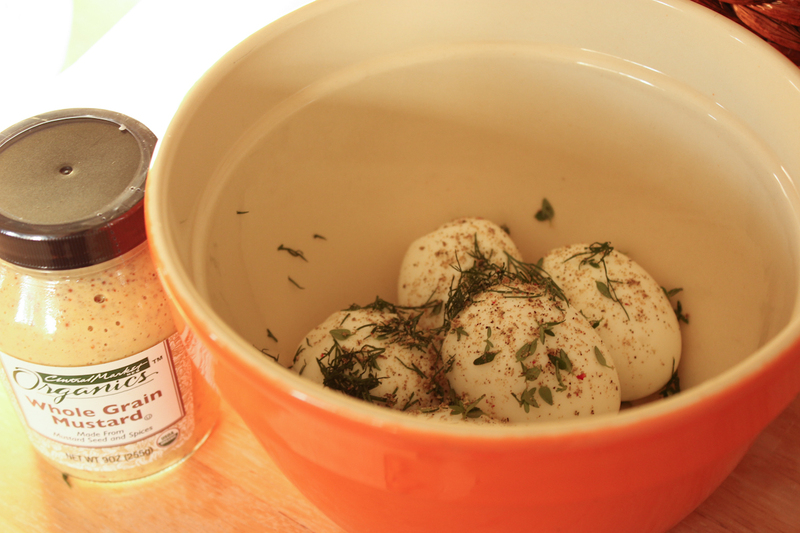 After shelling the eggs, I added some fresh cracked pepper, a sprinkling of salt, and the herbs. Next, I used a fork to mash up the eggs with whole grain mustard and light mayonnaise. I also find that plain yogurt can be used for part of the mayonnaise if you want to cut fat or calories. I use mustard, mayo, and herbs to taste. 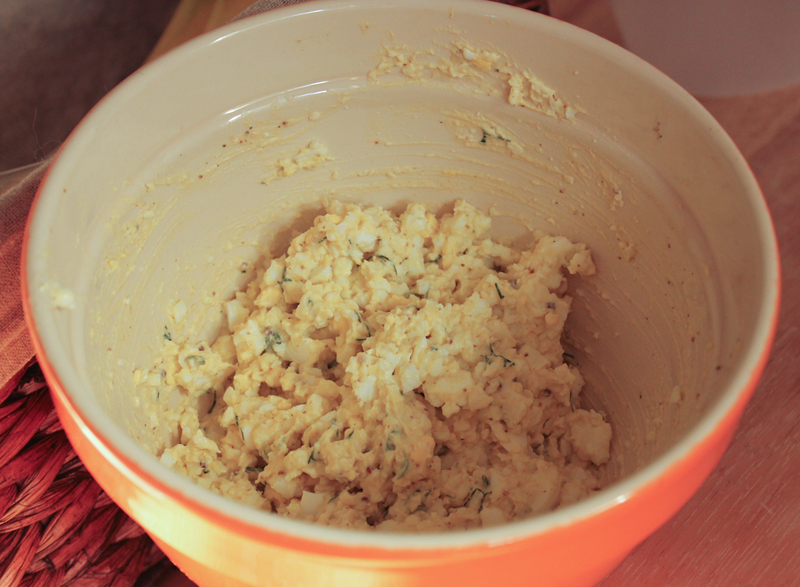 I like my egg salad on the chunky side so I stop mashing before it’s smooth. 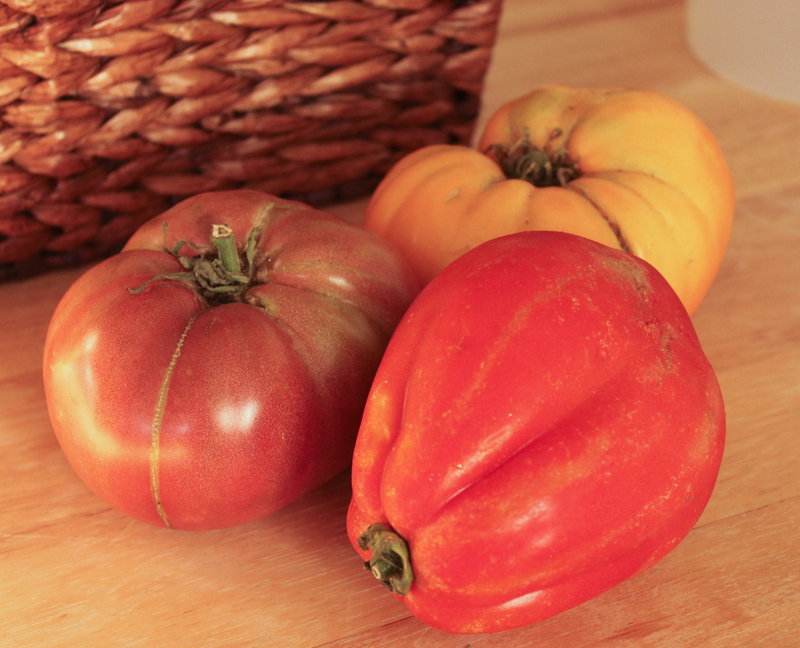 We ate the egg salad with some gorgeous heirloom tomatoes. To plate our dinner, I chopped romaine lettuce and topped it with heirloom tomato slices and chopped red onion and placed a scoop of egg salad on top. Delicious! Our new house came with a happy surprise. Three fig trees in the backyard! 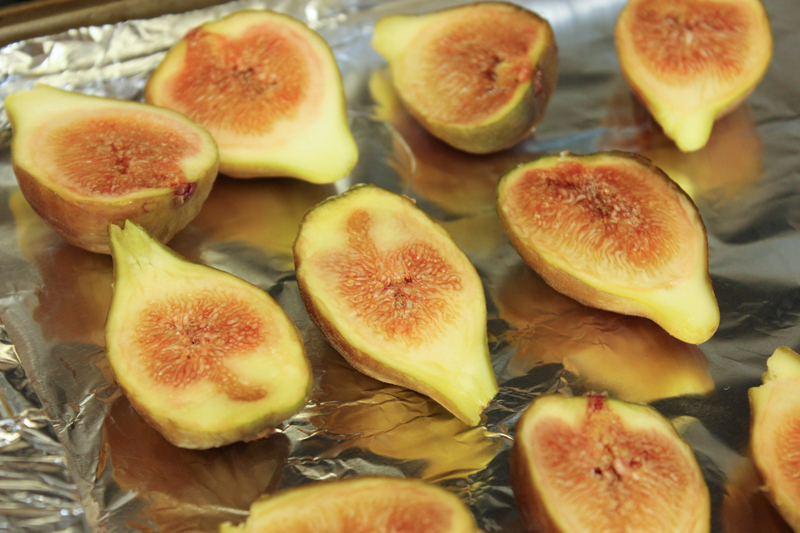 If you’ve never had the pleasure of eating a fresh fig, I highly recommend it, they are delicious. 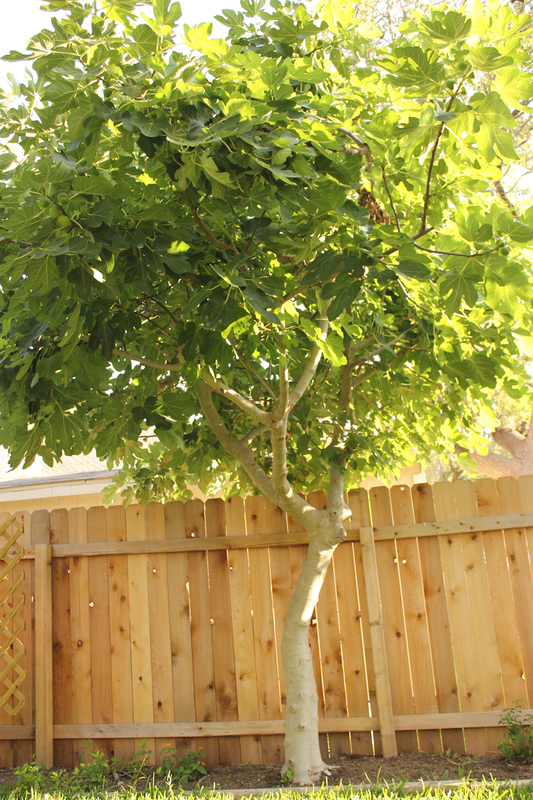 One of the fig trees is huge (for a fig tree at least). That’s one giant fig tree. Our giant fig tree has special powers. It makes giant figs! 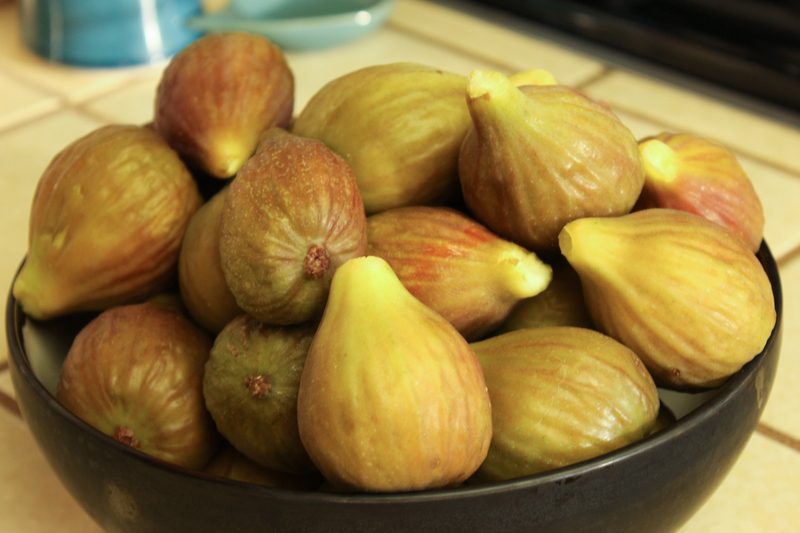 Most figs are small, maybe the size of a small lemon or so. This tree produced figs that were bigger than some of the largest apples I’ve ever purchased! Not all the figs get that big, but some of them do. Even its average size figs are large compared to other figs we’ve seen. 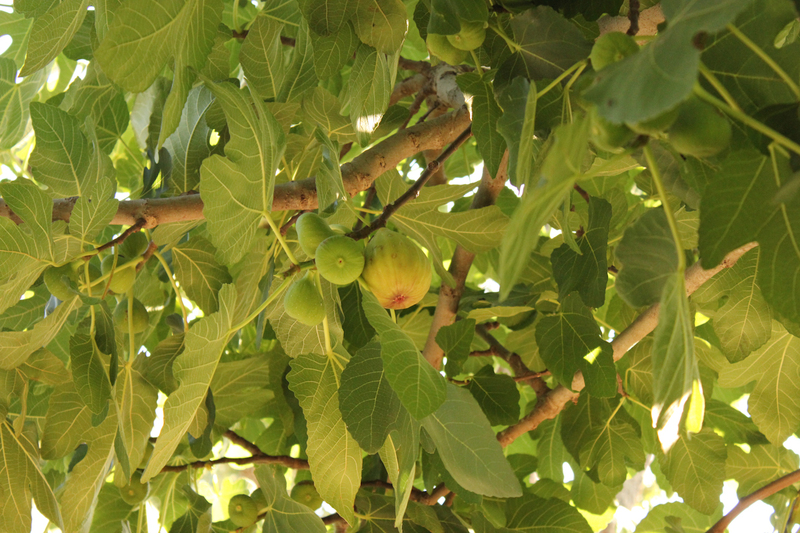 One ripe and some unripe figs on the branches. 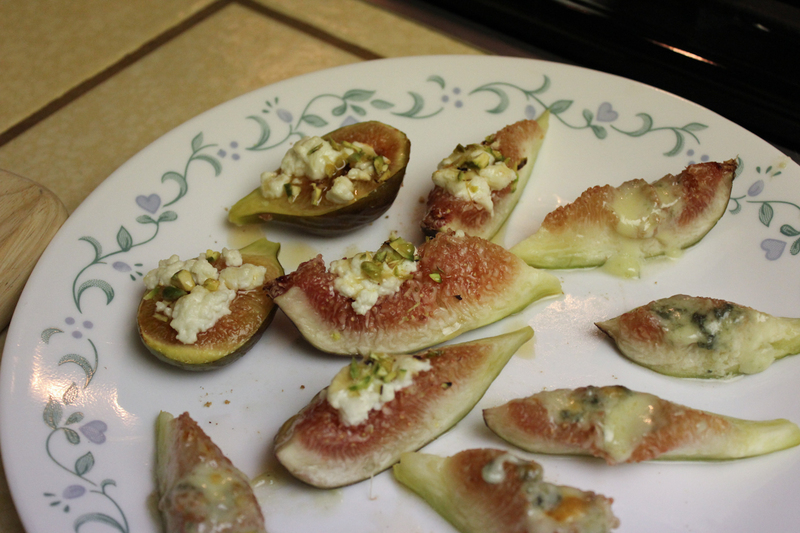 Broiled with goat cheese and then sprinkled with pistachio pieces and a drizzle of honey. Broiled with gorgonzola on top. Both were quite good. 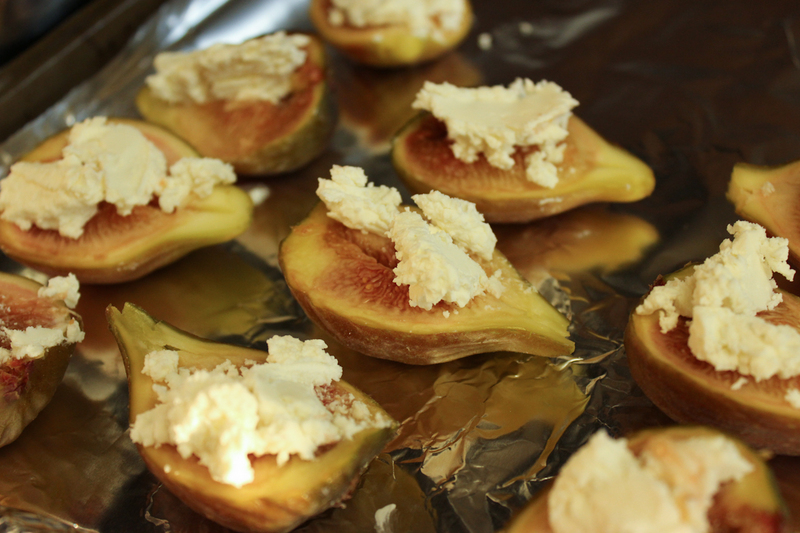 You got more of the fig flavor with the goat cheese but more of a savory bite with gorgonzola. Figs, ready for the eating! Prepare yourself for more fig posts, those trees are loaded! Seems like they ripen in waves though so it might be awhile before our next fig culinary experience. Yes, you read that correctly. A wreck. Not during a training ride of course, but rather on a 3 mile ride from the office to the movie theater on Friday night. I was even riding in a skirt because I was hardly going anywhere! I had just crossed a road and the bike lane I was in ended. Rather than take the right lane of the two lanes (which I often do) I opted to go for the sidewalk / parking lot area since I was decently close to my final destination. I angled myself into the parking lot driveway and neglected to notice the large cement lip between the road and driveway. I hit it and went down on my right side going about 17 mph. Once my bike and I stopped I was laying on my back in the middle of the driveway with a car trying to turn into the parking lot behind me. My first attempt to get up was thwarted by the fact that my legs and bike were all tangled. I eventually made it up and out of the way after verifying no part of me was broken. The driver and passenger of that vehicle stopped to ask me if I was going to be OK. They didn’t get out to help me get up, just stared at me. I realized was dripping blood everywhere from my elbow and the chain had fallen off my bike. Another driver (who was a cyclist also) actually got out and offered to give me a ride somewhere. He put the chain back on my bike. I really only had to go one block more so I had to turn him down, but I was impressed with his kindness. There is a bike store just next to the movie theater so I went in there with my bike because the brake and shifter handles were knocked out of position. Well, I did this as soon as I verified my work laptop was still working since I was pretty sure I heard it hit the ground in the crash. It works thankfully. The bike mechanics straightened the brake handles while I washed the blood off my right arm, which had finally stopped dripping, and cleaned four different scrapes on my left arm. 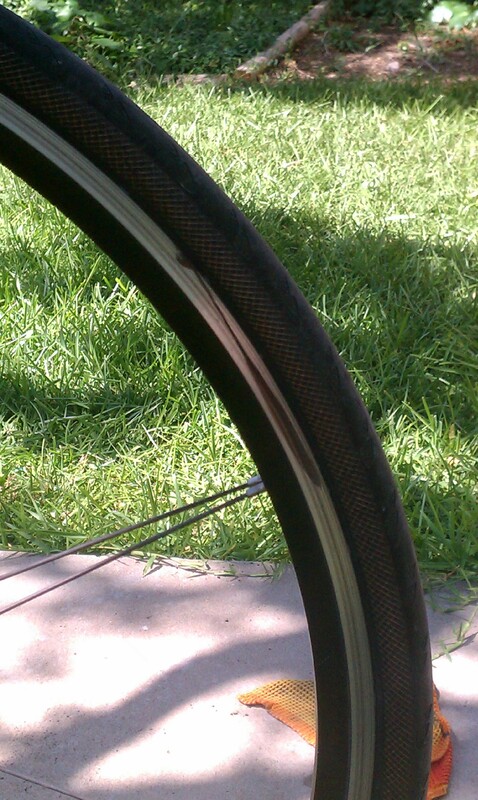 When I finished they showed me that the rear derailer was bent and almost touched the spokes of the wheel. While they readjusted it, I headed to CVS, also in the same plaza, for bandages. I phoned my husband to let him know why I was late to the movie and he was sweet enough to ask me if I wanted to go home despite the fact that he really wanted to see the Avengers AND arrived an hour early to make sure we got good seats. I didn’t really see any point in going home so after fetching my bike again, I found his car, locked my bike up on the bike rack and proceeded inside. Besides, I could have wine and food in the theater. At that point I knew my training plan for the weekend had to change. On Saturday morning I needed to test out my bike and my badly bruised knee somewhere that I could easily bail to the car if needed. My husband was out of commission at a bee keeping class an hour away so he would be unable to rescue me if something happened. I headed to the Veloway in south Austin to ride loops around the 3.1 mile course, closed to cars and pedestrians. My knee felt pretty good, if a bit weak, so I roade 8 laps easier than I otherwise would have. The rear shifting was a bit off so I stopped by Bicycle Sport Shop for an adjustment on my way home. It turned out that the rear derailer hanger was ruined so I had to head to another local bike shop to get a new one. They had it swapped out and I was on my way in no time. That afternoon I put the bike up on my bike stand and finally cleaned it after many months of neglect. I washed off multiple drips of blood. I learned to adjust the rear brake as that had gone out of whack. Poor bike. Shifter all scraped up. Blood on the rim. A “badge of honor” as the bike shop employee put it. On Sunday I knew that I could ride longer again. I left home a few minutes before 7am so that I could beat the wind and the heat. Unfortunately the wind forecast was wrong and the wind started super early. I turned around to face the headwind earlier than planned because I wasn’t sure that fighting a strong headwind for 25 miles was a good idea with a weak knee and bad shoulder. I made up for it by riding in town a bit for a total of 53 miles. Seen on the ride: a cow at the dead end of a road. Anyhow, I promise next week to return to my regular short ride updates because there will be no crashing to go on about. Thanks for reading and remember – I’m training for the 2012 Pedal to the Point Bike MS ride in northern Ohio on August 4th & 5th. Consider supporting my participation by making a donation today!